Kampung Ayer, reputed to be “Venice of the East”, is the home to around 30,000 people from generations to generations. Experience hailing the local water taxi, the everyday routine of the residents of Kampung Ayer, then walk on stilts built to have a feel of how it lives in a village built on water.“Tamu Kianggeh” located on the banks of Kianggeh River, see Bruneian women and senior citizens from the water village selling an array of traditional cooked food and raw cooking materials ranging from local rice, fruits, vegetables and traditional herbs for medicinal use. Prior to the establishment of Tamu Kianggeh, sellers sell their products on floating boats.Tour includes pick-up and drop-off transfer to and from your ship at Serasa Muara Port.PLEASE NOTE THAT THIS TOUR IS DIFFERENT FROM OUR NORMAL LOCAL MORNING MARKET & WATER VILLAGE TOUR WHICH TRANSFERS YOU FROM YOUR HOTEL. The tour starts with pick up from your ship at Serasa Muara Port. Enjoy a 45 minutes scenic drive around the residential area and country side of Brunei. We will transfer you to the jetty in the capital city where you will get the chance to ride on local water taxi crossing the river. You will be taken on a walking tour of the water village where you can have a brief experience of how it feels to live in a village built on stilts above the Brunei River. Feel free to break the ice with the local villagers you see and don’t be surprised if you are invited for tea by some of them! On the other hand, if you opted for the local morning market and water village tour package starts with pick up from your hotel and drive to the morning local market in the capital city or locally known as “Tamu Kianggeh” located on the banks of Kianggeh River where you will observe most of the traders being Bruneian women and senior citizens from the water village selling things ranging from traditional cooked food and raw cooking materials ranging from local rice, fruits, vegetables and traditional herbs for medicinal use. Prior to the establishment of Tamu Kianggeh, sellers sell their products on floating boats. Handicraft enthusiasts will find various local handicraft items on sale as well. Your tour guide will brief you about the various local medicinal herbs and usage of various plants in the local ceremonial ceremony. Other than these, you can also get a chance to savour homemade local delicacies that are on sale such as: satay, ketupat and etc. 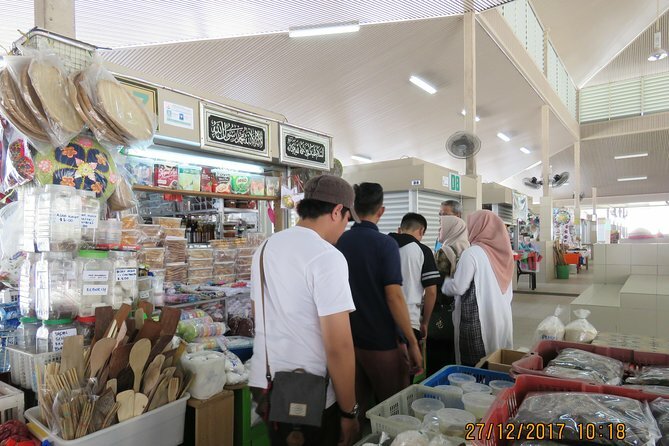 After local morning market visit, we will proceed with water village tour as mentioned above. The tour ends with drop-off at your ship at Serasa Muara Port. Anything not mentioned above in inclusions. Please refer to http://www.mofat.gov.bn/general-information#close for information regarding visas. A minimum of 2 people per booking is required for Seat-In-Coach rates to apply. Tours can be conducted in small groups (private basis) with additional costs. Pick-up from airport or other locations can be arranged with applicable charges.